Heat olive oil in a large skillet over medium heat. Season chicken breasts with salt and pepper. Place chicken in the skillet and cook until browned, about 7 minutes per side. Reduce heat; add butter and garlic. Cook and stir mixture until garlic is fragrant, about 3 minutes. 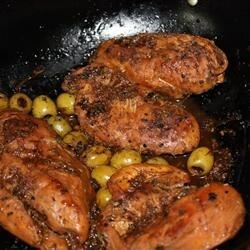 Mix olives, gin, vermouth, and lemon juice into chicken mixture; simmer until chicken is no longer pink in the center and sauce is thickened, about 5 minutes. An instant-read thermometer inserted into the center should read at least 165 degrees F (74 degrees C).